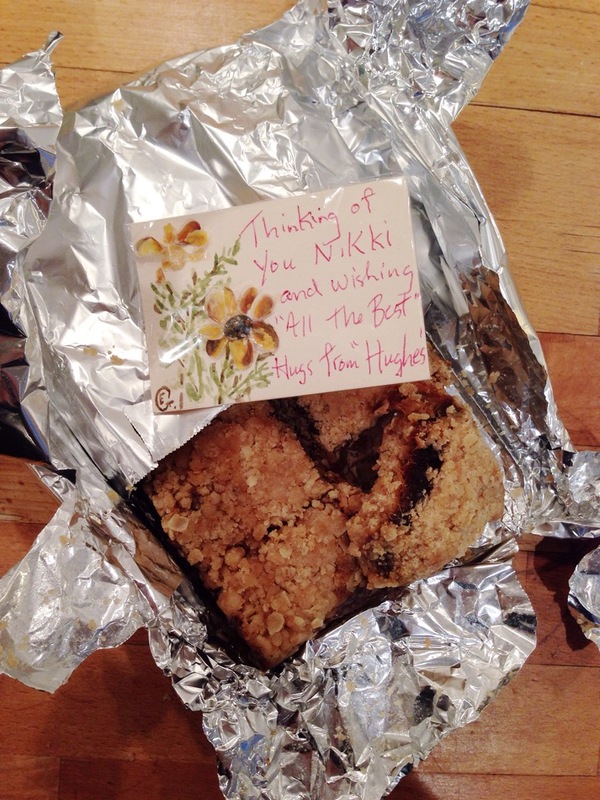 Mrs. Hughes – Worlds best date squares. – my story. I first met Mrs Hughes in public school, she was one of our Home Ec teachers. Among many crafts she taught me how to sew my first dress. I loved her. She was a kind and compassionate lady but what I loved most about her was that she was stern. She was similar to my mother in the… “I wouldn’t advice doing that if I were you… ” but would let you do it to find out that you were wrong. Best part was that she never faulted you for trying to go out of your limits. I remember fondly wanting to make a dress and how she taught us to do a “mock up” first and I insisted that the mock up was not necessary and that I was ready to sew it right away. After many conversations with her and her insisting that I “practice” first I went against her advisement and began to sew the dress. Had I been the perfect student I thought I was… the dress would have come out and fit me and looked beautiful – it did neither. I’ll never forget the look on her face… inside I think she was laughing, but on the outside it was plain as day and she without fail reminded me that it would have been in my best interests to have listened… however, it is what it is and “let’s fix it!”. Seems simple but I appreciated her not completely embarrassing me. I knew that I should have listened… who I am? I never made a dress? I’m not a dressmaker!!! She made it very clear in her undertone and by the way she was so calm and patient with me to fix the dress that I should in the future “just listen the instructions given”. Later in high school I become best friends with Lesley Hughes only to find out that Mrs. Hughes… “the Mrs. Hughes” was her Mom! Wow – I said… Your mom was my Home Ec teacher and she was a tough cookie, I loved her and she makes a mean date square! I’m so grateful to have such wonderful friends and family in my life and to be spoiled with Mrs. Hughes famous date squares is the best thing a girl could ask for! Big Hugs to “The Hughes Family”… I love you.